A yacht is a generic term given to a boat with sails, or sometimes an engine, used for either racing or pleasure. 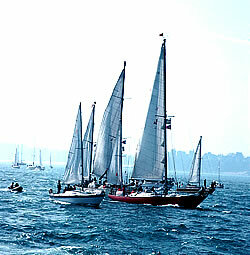 There are many types of yachts which include small dinghies, racing and sailing cruisers, multihulls and superyachts. Dinghies and multihulls will be described further down this page. A cruiser is generally the name given to a yacht that has enough space to sleep on. They tend to have a engine which is often used to get in and out of a marina or off a mooring. If you are looking for a motor cruiser (i.e. one without sails), have a look at our Motor boat section. There are several good yachts for those who will be sailing alone - maybe the wife (or husband) doesn't want to come along. Hurley, Corribee or one from the list of companies above would be a good choice. There are many very good second-hand yachts of these types around as they have been available for a while. Do think about where you are going to store it as some are not suitable for tidal moorings. Some of the pictures below illustrate the range of these sizes, but do not represent those listed above. Superyachts, mega or luxury yachts can again be powered by sail or by an engine and tend to be over 25 metres long and up to the size of a mini cruise ship. A dinghy can either be a small sailing boat or an inflatable boat usually under 5 metres (16 feet) in length. Some of them do not have cabins and therefore would not have space for people to sleep on, and hence cannot be considered as cruisers. Again there are many types from monohull to multihull boats. Most people wiil certainly be familiar with the dinghy classes such as the Laser and Finn classes which appear in the Olympic Games. Dinghies are ideal crafts to learn to sail on and if you are considering buying a dinghy there are plenty of manufacturers to consider including Laser Dinghy , which make a range of dinghies from the small pico (ideal for beginners) through to the Laser SB3 sportsboat. The Mirror dinghy is the classic family sailing dinghy and is used by beginners, the experienced sailor, and for racing. The UK Mirror Class Dinghy Association is an organisation which organises a comprehensive programme of training and racing for all abilities and is well worth joining. Another very popular sailing dinghy is the Wayfarer. The Wayfarer has been a successful and excellent training boat with a long pedigree and is the ideal boat for many uses including day-sailing, and racing. Manufactured by the long established and highly respected dinghy and small keelboat builders Porter Brothers . Their extensive range of models account for some of the most popular designs which also includes the internationally respected Optimist dinghies. The Optimist is one of the most successful boats ever designed currently found in over 100 countries world wide. It is an ideal boat for learning, training and racing especially for youngsters under the age of 15. To get the most from your Wayfarer dinghy join the United Kingdom Wayfarer Association who have an excellent programme of racing and cruising events. 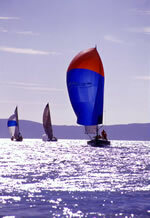 Topper Sailboats are well renowned for their high quality plastic dinghies. Whether you are looking for a boat which is the perfect introduction to sailing, or a boat for the whole family, Topper Sailboats has the answer. If you ask the question "What is the ideal dinghy for a beginner?" the answer could well be the Access range of dinghies . They are designed to appeal to those who would love to have a go at sailing, but find it too difficult or uninviting to do so. Ideal for able-bodied and the disabled, the Access Dinghy design features allow total novices of any ability to sail with little or no tuition, nearly regardless of the conditions. There is also a big range of inflatable dinghies which are described in the Motorboat section. Check out the Sailing Dinghies for Sale section for the latest list of UK dinghies for sale from ApolloDuck. 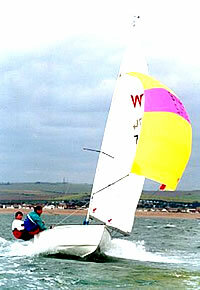 Hobie Cats are a good example of the dinghy class of catamaran. If you are looking for an affordable but exciting alternative to a monohull boat then the Exciting Range of Ex Aqua - Astus Trimarans which have been designed to offer maximum pleasure with minimum hassle are a fast, fun and safe option. Their folding floats give you access to narrow slipways and monohull berths in marinas and their light weight make them towable even by a small car.